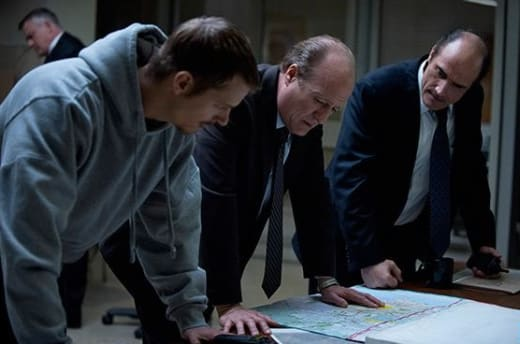 With every passing episode of The Killing Season 3, I've found myself glued to the TV, hooked on the intense and dark moments played out over each hour and excitedly preparing for the final payoff that wraps up the serial killer-themed arc. I know we're nearing the end, that final stretch, and the dramatic tension is at all time high... even if Linden and Holder don't feel like they're one step closer to finding their murderer. And it's funny because even though I'm interested in who the face is behind the slayings, it hasn't been the thing that's kept me tuning in every week. 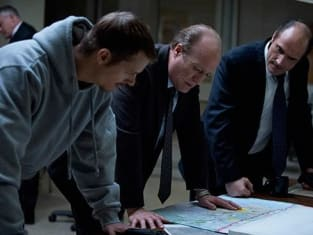 Ultimately, I think that's something that unfortunately drove The Killing Season 1 and definitely Season 2. As much as I reveled in watching Linden and Holder, the focus became so heavy on figuring out Rosie Larsen's killer that everything fell to the wayside whether it was interesting or not. Yet this third season has managed to captivate in a way that went beyond the cut and dry. Sure, Linden's passionate dedication and her rapport with the street smart and witty Holder has been a TV relationship worth watching. But the surrounding entities from Linden's former partner, now boss (who I have a sneaking suspicion about), to the always riveting portrayal of possibly innocent Ray Seward have added their own positive layers. There's more to keep you invested even if the whole concept of the serial killer taking out street girls is intriguing itself. Take Pastor Mike, for example, who turned out not to be the killer. Was I surprised? No. Was I upset that I was led to believe otherwise? No, once again. The situation he was placed in felt believable and it gave him time to explain his sad side of the story about another innocent man wrongly accused. Except there was still a level of tension involved as he forced Linden to drive around the city while he sorrowfully looked out the window or stared back at her through the review mirror. Most of the time, I kept waiting for him to turn the gun on himself. There were so many moments from the gun close to his mouth before Linden admitted she lost her son on her own, finding out she did have a radio, and even falling to his knees to pray, that I was prepared for him to die. And when he refused to take his hands out of his pockets, I was ready for the cops to lay fire. But Linden was there to save him in a way and stand in front of him, emotionally calling for him to put his hands up. Really, Mireille Enos brought out that raw and flawed side to her character that escalated during this dramatic moment. I felt for her, especially as she felt like one of those kidnapped girls, and even watching her collapse shaken beside a caring Holder. This was a different side to Linden, one really pressed against the wall, and through it all, still trying to remain strong and solve the case. As it was, even Seward further broke from his hardened shell having a panic attack after his lawyer basically ignored his pleas. Can you imagine the person supposed to be fighting for you, even if all the appeals and chances seem up, to look at you and ask what you want done with your remains like it's already over? I've got a feeling Seward is going to give up his parental rights to his son's foster parents on the condition that Linden can speak to Adrian. I just hope it's enough and enough time to mean something. The only other person who might know the real identity is Bullet - and she and Holder are on the ends and deservedly so. It was great to see Holder pissed off and driven to save Linden, while also being betrayed by Bullet (even if Bullet didn't really know what was up.) Let's just hope Bullet doesn't get taken out by the mysterious driver outside. You can certainly add "Try" to the list of good episode on this roller coaster ride of cops, killers and the heightened drama surrounding the characters involved. I really can't get over how well done this return season of The Killing has been crafted and executed. If it can deliver a solid ending after all this rising tension and drama, not only will it be the best of the seasons, but it'll have me craving and clamoring for season four.